Aaron has been working with metal since his grandma sent him to the backyard to pound nails into an old stump. Construction came naturally and he was managing government projects before he was 18. It was his challenge to transform the architectural plan into an actual building. Most of the work was concrete and steel– exacting and non-forgiving components. Artistic deviations were not in the budget and as responsibilities grew so did the distance from home north of Spokane, WA. 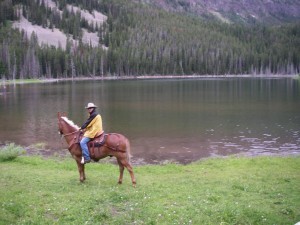 While managing a three year project in Montana, Aaron was distracted by the love of his life. “She encouraged me to search for and follow my passions and dreams,” says Aaron. Knowledge and self-improvement led Aaron to the MSU Farrier School and blacksmithing. Watching the fire in a forge and waiting for shoes or iron bars to heat allows time for imagination and creativity. Aaron’s wife Jenny, a Parelli 3 Star Natural Horsemanship Instructor and Aaron now work together on many occasions—Jenny train’s students to develop that special partnership with their horse while Aaron addresses any hoof care needs. Aaron has also passed his Parelli Level 3 On-Line and Liberty with his mule, giving him that special ability to offer great horsemanship his equine clients! In addition, Aaron enjoys exploring the craft of blacksmithing. Discuss with Aaron how it can become a reality! !